Homeowners often bemoan the lack of closet space in their house and entertain daydreams of increased storage and walk-in closets. If you have a spare bedroom that is not getting much use, you can make that dream come true. Turning a bedroom into a closet is an ideal way to add a walk-in closet to your home without running up a huge remodeling bill. Adding built-in shelves and drawers provides more storage in a bedroom-converted closet. When turning a spare bedroom into a walk-in closet, proximity to the master bedroom and bath is crucial. If your spare bedroom is on another floor or located all the way down the hall, it may not be the most convenient option for a closet. Ideally, the spare room should be located next to the master bedroom and bath so you can easily move back and forth between the spaces when you are getting dressed in the morning. If the spare bedroom is located adjacent to your master bedroom, you can even think about installing a door between the rooms to provide easier access. A spare bedroom that has many windows is not the best option for a closet because prolonged exposure to sunlight can fade your clothing and may cause the space to overheat. If you must use a spare bedroom that features many windows, cover them to block the sun. Forgo thin, gauzy curtains, and opt for room-darkening shades that can keep the closet cool and dark to protect your clothes. The benefit of using a spare bedroom to create a closet is that you will likely have plenty of space for clothing storage. Instead of simply adding rods or rolling racks for your clothes, add built-in cabinets, drawer units or shoe racks for additional storage. Glass-front cabinets are an effective option because they allow you to see what is inside as you try to decide what to wear. You may even want to add a center island with drawers and shelves. Its flat countertop can also provide a surface for folding laundry or housing jewelry boxes and storage containers for smaller accessories. 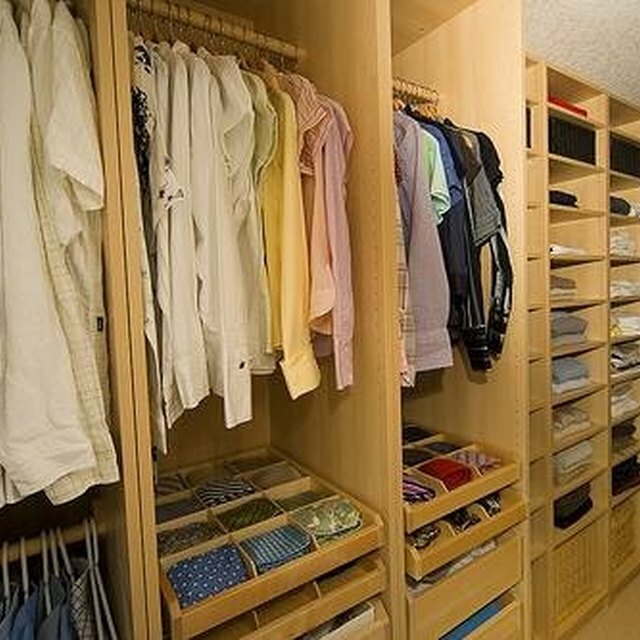 Homeowners often enjoy the idea of a walk-in closet because not only can it provide space for plenty of clothing storage but also because it can serve as a dressing room as well. In a converted bedroom closet, you may have additional space to add a vanity so you can put on your makeup in the space as well. As a former bedroom, the closet will have electrical outlets, which may also allow you to blow dry your hair or use other heated styling tools. This type of setup may be particularly helpful if your home only has one bathroom and you must get ready alongside a partner or roommate in the morning.